Steve and I went to the World Famous Yellowstone National Park. Yellowstone is a popular National Parks destination. 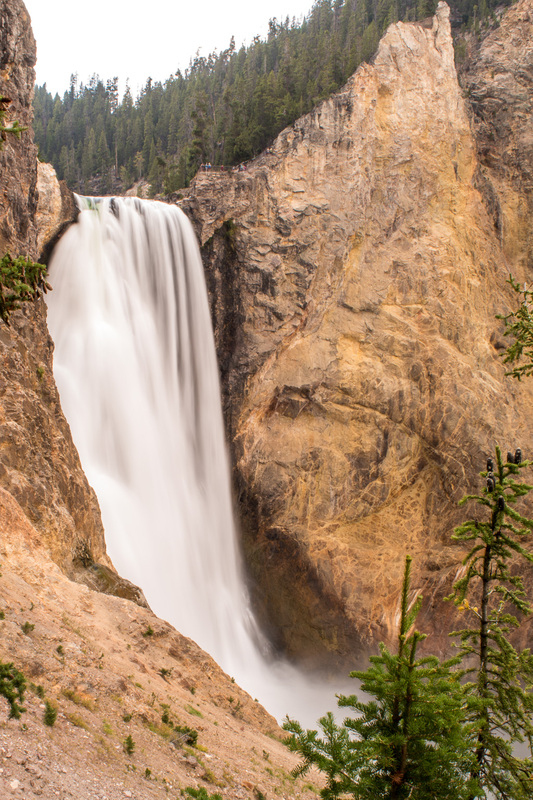 Yellowstone delights over 4 million visitors each year. It is the country’s first National Park, established in 1872. 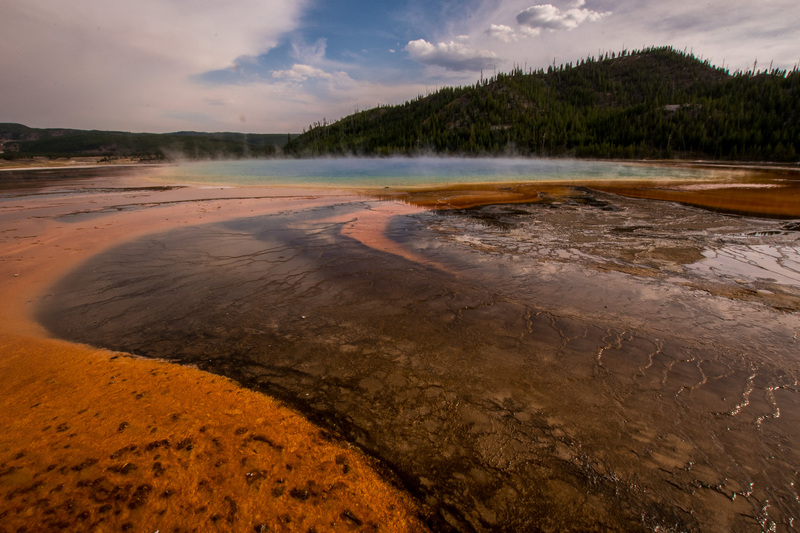 Yellowstone is a volcano that has erupted three times, 2 million years ago, 1.3 million years ago, and the last 640,000 years ago; thus forming a 30 by 45 mile caldera. 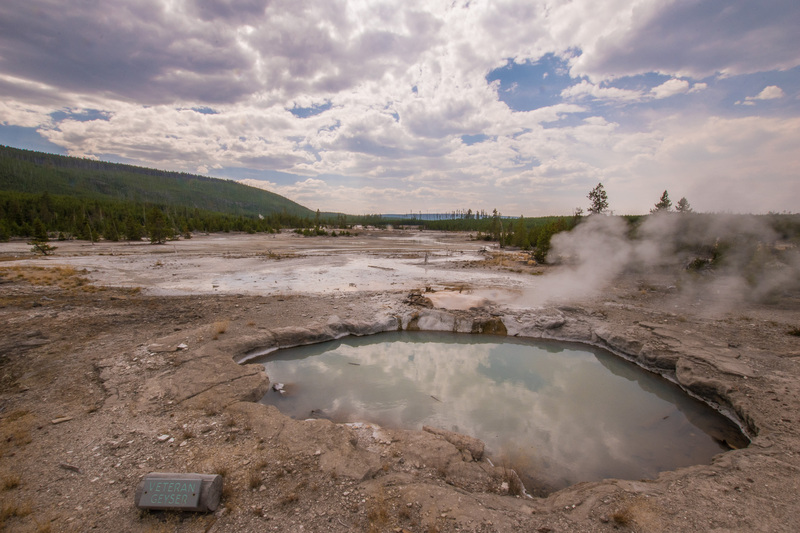 The magmatic heat still powers Yellowstone’s geysers, hot springs, fumaroles and mudpots. The lava flow caused magnificent riverbeds & waterfalls. What makes Yellowstone truly unique is that it sits in the middle of a plate. Most volcanic activity occurs on borders of plates where the plates are colliding and submerging. Yellowstone is truly special. This is a popular destination for visitors from all over – we met people from Russia, France, Germany, England, Australia, Japan and China. It is the Walt Disney World of National Parks. We noticed that with big crowds, bad behavior follows suit. There were many times we felt we were on an episode of Kron 4, “People Behaving Badly” and kept looking for the hidden cameras. We enjoyed what Yellowstone had to offer, but if you are not super into crowds, people, and more specifically watching people potentially harm themselves or the environment, this might not be a place for you. If you can tolerate crowds, and follow directions from a sign – you should check it out. Our highlights included seeing the hundreds of geysers and hot springs, as well as seeing lots of wildlife. Yellowstone has 23 hikes, but we did not partake in any, sadly. We decided to give our feet (and their blisters) a break, and drove around Yellowstone to make sure we saw all the sights. Even with the driving, we still walked 33,000 + steps in the two days we were there. We should also point out, there were several fires at Yellowstone during our stay. The fires caused a heavy haze throughout the park, delays in traffic and closures of certain areas and roads. The National Park Service views fires very differently than they did 50 years ago. Do you remember as a kid hearing Smokey the Bear saying, “Only you can prevent forest fires”? Now he says, “Only you can prevent wildfires”. 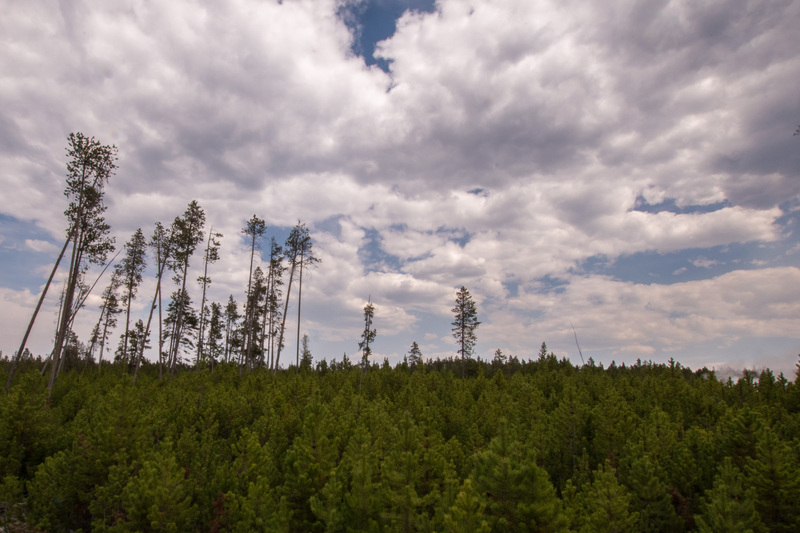 Natural fire caused by lightning (aka “forest fires”), helps clear out overgrown areas and allows for new grass, shrubs and trees to grow, and it kills diseases and insects that prey on trees. An example of this is the Lodge Pole Pine tree, named that way because many Natives would use these trees for their Tipis. The Lodge Pole Pine tree produces a small amount of special pinecones that are sealed up with sap. They are only open by the heat of a forest fire, releasing the seeds contained within. This unique trait allows the Lodge Pole Pine to be one of the first trees to start regrowth after a fire. 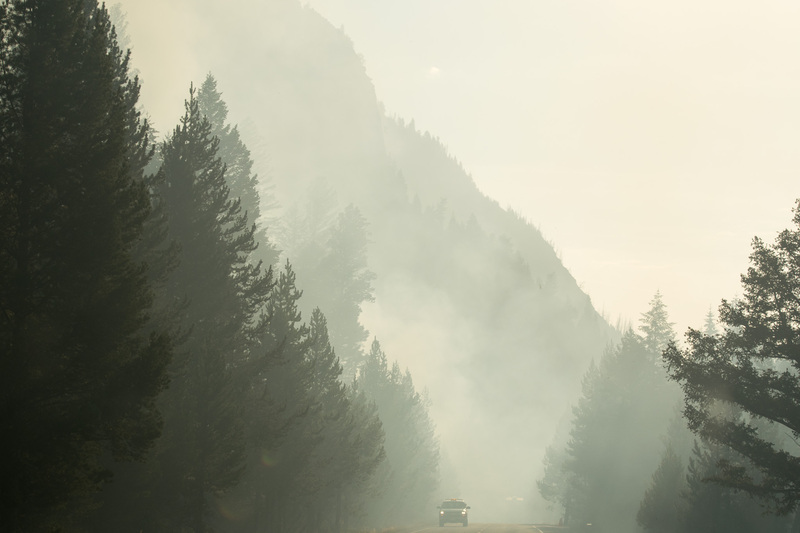 With this understanding, that forest fires are vital to the natural forest life cycle, The National Park Service now only attempts to extinguish fires if they pose any threats to people, building and other infrastructures. We stayed at the KOA in West Yellowstone, Montana. It wasn’t the crown jewel that Glacier’s KOA was, but it was nice enough and a convenient location. It was about a 10-minute drive into the West Yellowstone entrance. Other amenities included an indoor pool, volleyball court, basketball court, horseshoe pit, restaurant, store and a dog run out area. We made friends quickly with our neighbor, Erica, after playing with her Vizsla, Bailey, who was 6 months old and cute. They live at the KOA for the summer, doing a work to live program. This allowed them to visit Yellowstone several times. Erica and her husband decided to quit their jobs last year and take their four kids on the road. They sold their belongings and homeschool their kids while traveling the country. They were not sure what their next plans are after the summer at Yellowstone. We found their story fascinating. 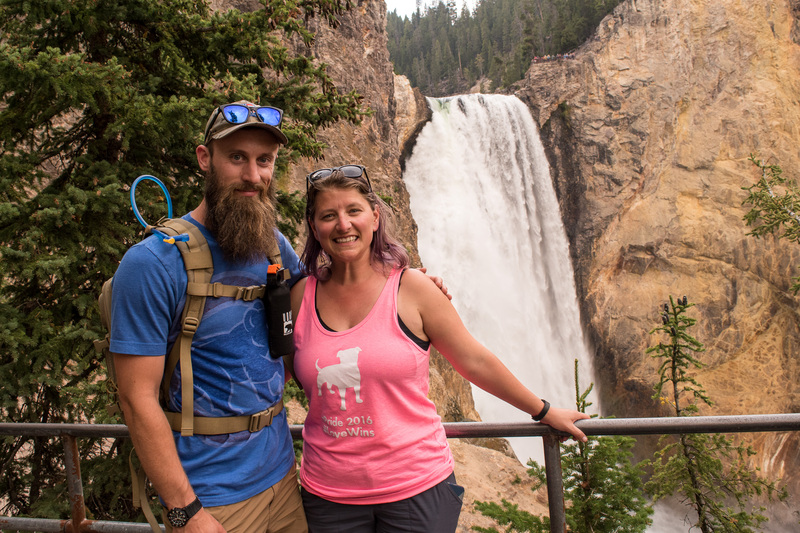 Our first full day at Yellowstone was Monday, and we made a FULL day of it. We were in the park before 9AM and were blown away that we saw bison right away. After the wildlife detour, we headed straight to Old Faithful. Old Faithful is located in the Upper Geyser Basin, which is the largest concentration of geysers in the world. Old Faithful is the most consistent with its eruptions, erupting every 90 minutes (+/- 10 minutes). For us, it erupted 2 minutes early, and lasted about 3 minutes. If you want to watch it, you can download the Yellowstone Geyser app and watch it live on the webcam! From Old Faithful we explored more of the Upper Geyser area. We got lucky and only waited 5 minutes for the Grand Geyser to erupt. Grand Geyser is the tallest predictable geyser in the world. We watched the 10-minute eruption and it was stunning. 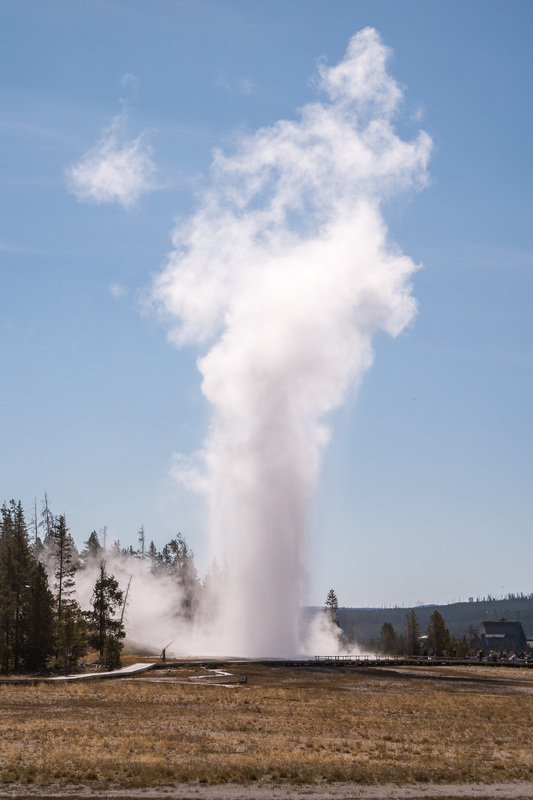 What makes Grand different than Old Faithful is that it consists of 1-4 bursts (at times reaching up to 200 feet), whereas Old Faithful is more of a constant stream. This is due to the fact that they are two different types of geysers. 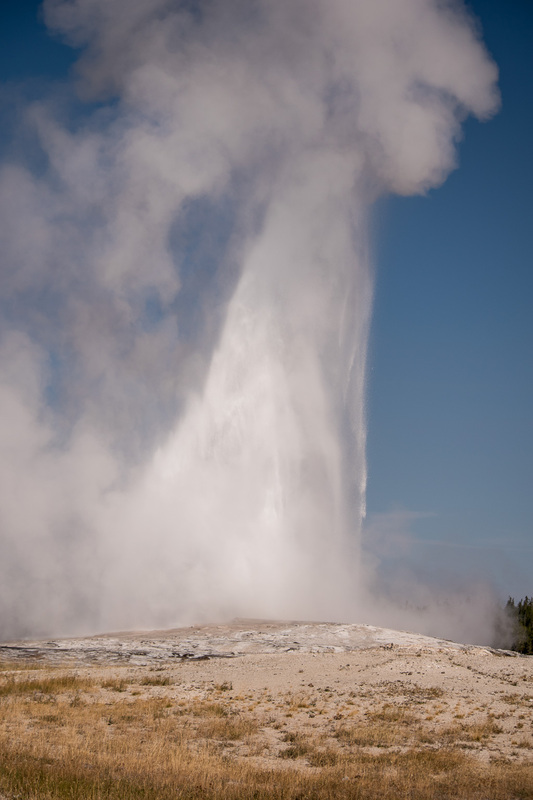 Old Faithful is a “cone-type” geyser, were it shoots a concentrated jet of water out of a cone of rock. Grand on the other hand is a “pool-type” geyser, where it shoots the water up in all directions through a pool of water. We noticed through Yellowstone at geysers, many people bring lawn chairs, books, food, puzzles, and just sit out and wait for a geyser to erupt. We went by a couple waiting for the Constant Geyser to erupt, they had already waited 6 hours when we talked to them. That might be a great way to spend our retirement! 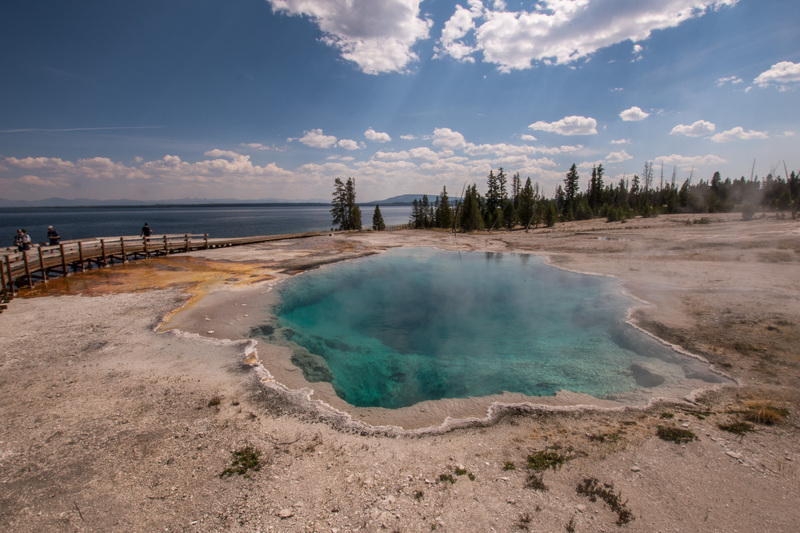 After exploring the Upper Geyser Basin we hit the road and headed to the West Thumb Geyser Basin. 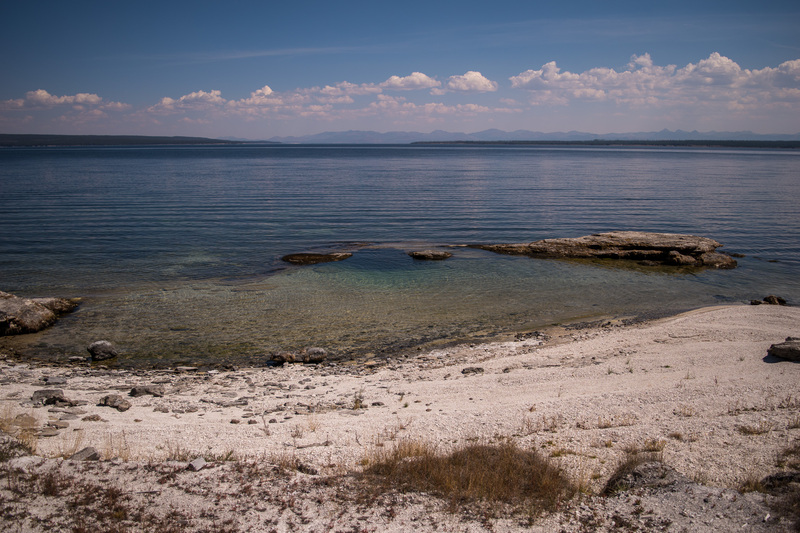 West Thumb is off the coast of the Yellowstone Lake and is beautiful. From here we saw views of fire & smoke. We walked along the shoreline and checked out the geysers and hot springs. This spot seemed to be skipped by tourists, but we enjoyed it and would recommend it to our friends. Our next destination was the Canyon area. On the way to the South rim, we were treated to bison on the road. They own the road, as they weigh more then some of the cars on it. Everyone makes way for them, and can you blame them!? In the South Rim we did “Uncle Tom’s” trail. It is a trail that leads you down the lower waterfalls (almost 500 vertical feet). This trail included 328 metal steps down the canyon. The views were great, and well worth the hike back up the canyon. We then make a visit back to the Middle Geyser Basin, where we fought crowds (elbows out) to see the Grand Prismatic Hot Spring. We were spoiled with breathtaking colors and views. By this point, it was late in the afternoon, and we decided to call it a day, not getting back to camp until after 6:30. 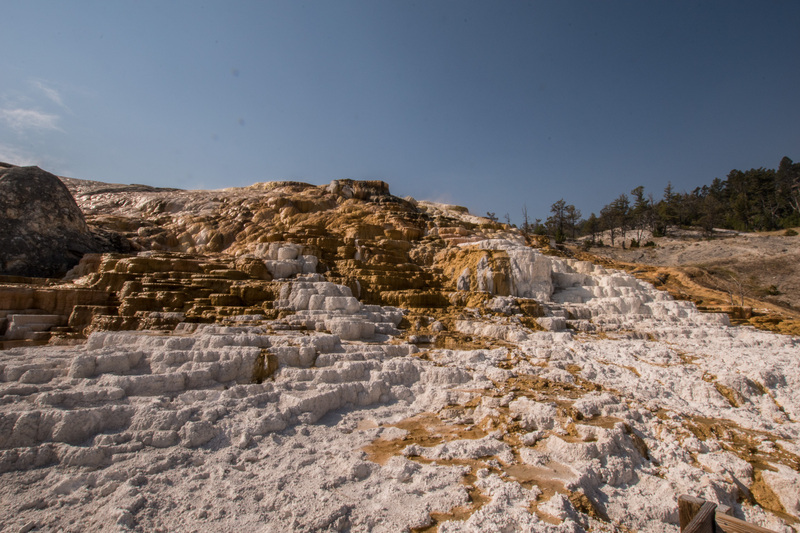 On Tuesday our goal was to get to Mammoth Hot Springs (in the North West part of the park) before the big crowds. We got into Yellowstone by 8:30, and to Mammoth by 10:00. Mammoth Hot Springs is constantly changing, like most of the park. Active areas can suddenly be diminished, from an earthquake or other unknown reasons. We were impressed with the Palette Spring. It looked like a watercolor portrait. We also made sure to see the famous Liberty Cap. 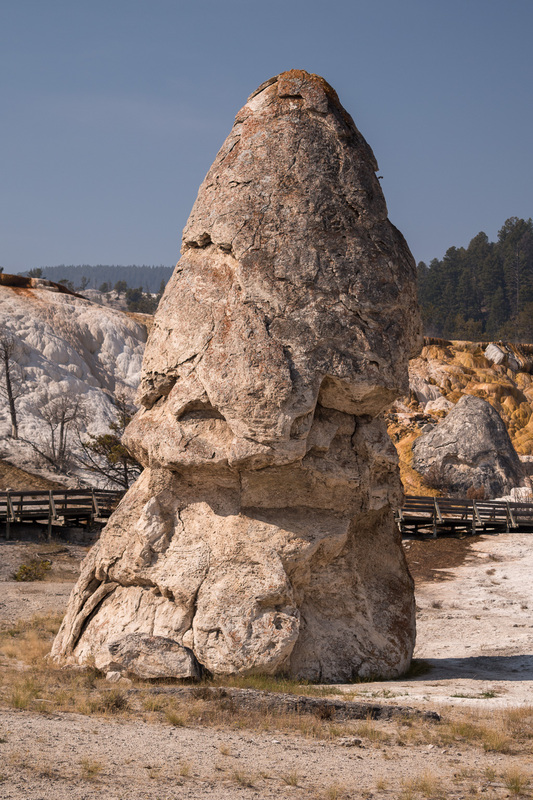 The Liberty Cap was created by a hot spring that was active for a long time, allowing mineral deposits to build slowly and continuously. While here, we made a visit to Fort Yellowstone, once home to the United States Army Cavalry. It was here, near the one of the housing units we saw a grown male Elk taking a nap. We went back towards the Canyon area and made sure to make stops where views of the Yellowstone River. Yellowstone is a lot of driving, we recommend downloading the Gypsy Yellowstone companion. It utilizes GPS (even when you have no cell signal) to give you useful information about Yellowstone. It will point out upcoming turnouts and scenic views. If you are driving yourself through Yellowstone, it is worth the $4.99 download. We spent our last stop at Norris Geyser Basin. Norris Geyser Basin is an active earthquake area (it is near the intersection of three major faults), one of the hottest and most acidic areas in Yellowstone and is home to the tallest active geyser in the world, Steamboat Geyser (the last time it had a major eruption was in 2014 – so we weren’t going to wait). We should mention, when you visit Yellowstone, you will experience a full sensory overload – the smells, the sounds and beautiful sights. I enjoyed the sounds of the gurgling geysers; it made me laugh every time I heard a good one. The smells can be intense, and vary by area. Norris Geyser Basin, at times smelled like a million farts, I wish I was joking, but yes, that is what it is like. Needless to say, we made a quick loop walk and got out of there. We called it an early day and headed back to camp to do our chores. After dinner we decided to do some wildlife searching and drove back to Yellowstone. We thought that around 7:00 wildlife would be most active and were really hoping we would see a Grizzly Bear or Moose, but our efforts were a lost cause. We saw some Bison and Elk, and even heard the male Elk bugling, but not the two we were hoping to see. I know I had mentioned it earlier, but people do not follow signs or walkway paths (we even saw people stick their hands into the hot flowing water…. Surprise – its hot and it hurts! ), but we were surprised at how brave (and dumb) people got when it comes to wild animals. A group of tourists even went close enough to an elk to touch it. The elk of course didn’t like that and took off. I was anticipating the elk would kick the woman, but it didn’t. 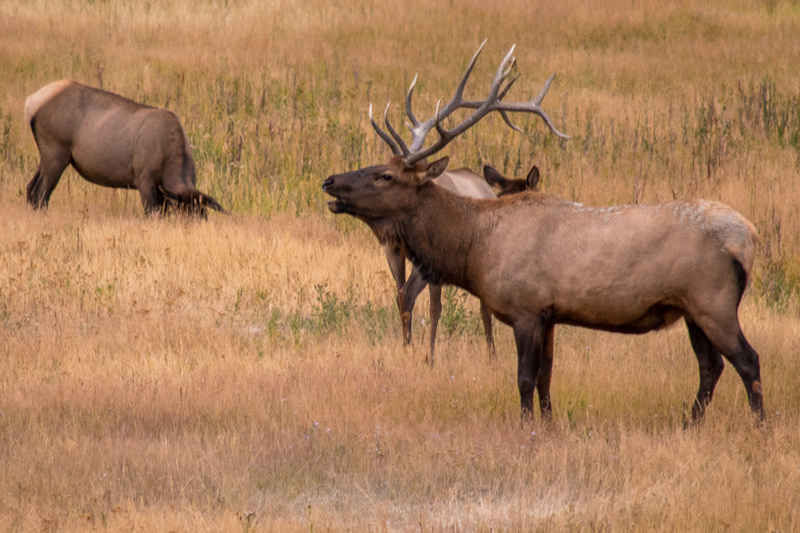 I think that was the major theme of our visit to Yellowstone – a total lack of respect for the animals and the environment. I really hope it was just a fluke since we were there during a busy week, but I assume this it how it is, and it’s just sad. The Park Rangers had their hands full between the fires and dealing with dumb tourists and were doing a great job. In the morning we hit the road by 8:30 to make our way back to Bozeman to pick up Sparky. On the way, just after Big Sky, Montana, we got stuck in traffic. We were at a standstill for over an hour. Every one turned their car off and got out and started chatting with neighboring cars, we have not seen anything like this in the Bay Area. I would never dream of getting out of my car on 101, but somehow, the locals knew this was going to be a long wait. On this two lane highway, if there is an accident, there really isn’t any way to get through, so you just have to wait. During our stall, we met Joseph and John; brothers from Northern Montana (near Glacier), third generation born here from Germany, were fluent in both German and English, and own a construction company in nearby Bozeman. We enjoyed chatting with them and found out Bozeman was becoming quite a popular place for people from California and Chicago to move to. However, this 90 minute delay ended up costing us two hours, as we had to add an unscheduled lunch/dinner stop. 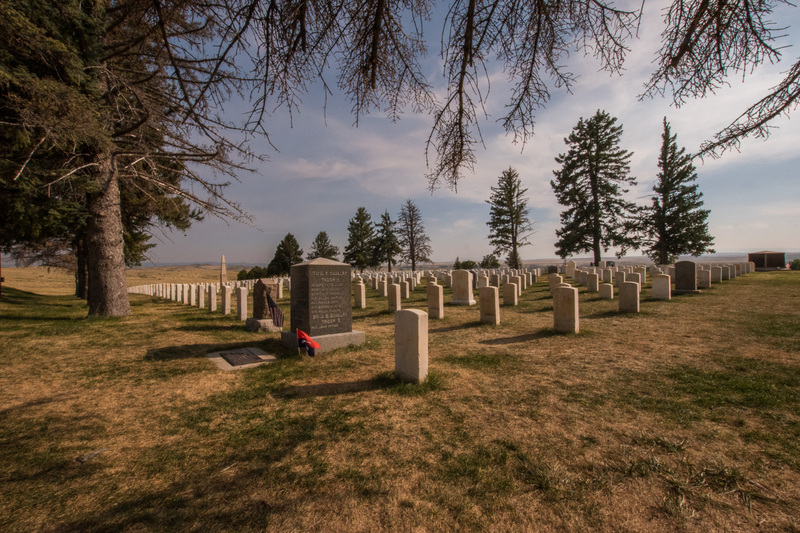 We did enjoy our scheduled pit stop at Little Bighorn Battlefield National Monument. The Little Bighorn Battle is an interesting one. It was the nation’s last battle against the Native Americans, occurring on June 25, 1876. This battle might sound familiar to you (circa 4th grade history) because the major players were Lt. Col. George Armstrong Custer (“Custer Luck”) and Sitting Bull. The Lakota and Cheyenne tribes (two of many) were given a reservation from the federal government, and a peace treaty was made… but gold was found on that reservation, and gold seeking Americans ignored the treaty and the US government’s warnings, and went and mined anyway. This of course didn’t sit well with the tribes. The government attempted to buy back the land from the tribes, which proved unsuccessful. The Lakota and Cheyenne tribes left the reservation and resumed raids on settlements and travelers among the fringes of their domain. The two tribes refused to go back to their reservations, resulting in the Battle of Little Bighorn. Soldiers/fighters on both sides lost their lives, 260+ American lives, including Lt. Col. Custer, and no more than 100 Native Americans. The Native Americans were considered victorious in this battle, but ultimately lost the war. Sitting Bull and his tribe fled to Canada shortly after this battle. Steve and I both love a good battle story and were consumed by this one and the sights of memorials and the National Cemetery on site. If you are driving on Interstate 90, we would recommend this stop. It is five minutes off the freeway, and has great exhibits. Yellowstone is massive; you can stay a week here and still not get everything done. Next time, we would like to do some of the hiking trails. We also would love to spend time at the Yellowstone Lake. I saw a few Horse tours, and even Steve was interested in possibly taking a horse tour. When making the trip, we decided not to go to Grand Teton National Park due to time. We regretted that and wish we had planned to go there next. 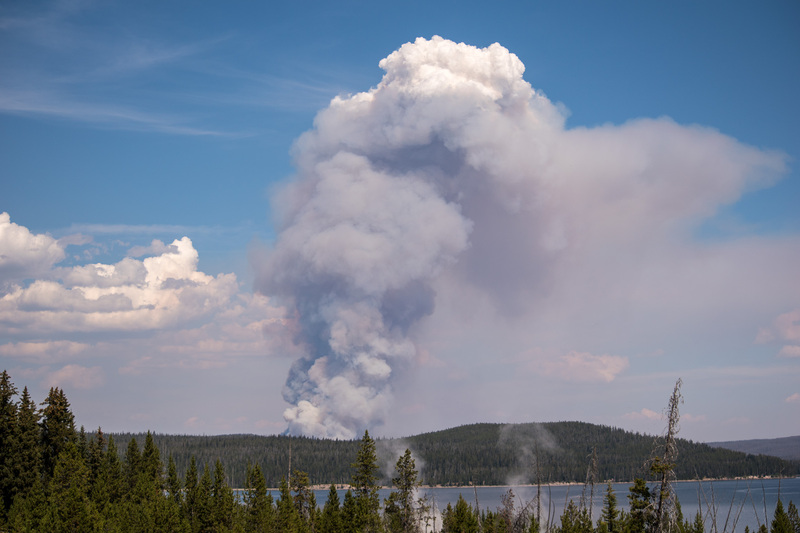 As it turns out, it was for the best, as the road from Yellowstone to Grand Teton was closed due to fire and would’ve taken a long time to get there. Everything works out how it’s meant to, and we know that we will make it there eventually. We arrived tonight at Devil’s Tower, Wyoming. It was too late (and dark) to visit the monument, but we will be going there tomorrow morning. Our plan for tomorrow after Devil’s Tower is uncertain. We will be heading to Rapid City, South Dakota for a few days. We hope to go to Mount Rushmore, Badlands National Park, the Minutemen Missile Historic Site, Jewel Cave National Monument, and Wind Cave National Park. Update: I forgot to mention the wonderful boarding Sparky stayed at, while we were off playing at Yellowstone. Dogtown in Bozeman was awesome, and tired our little crazy dog enough for him to sleep 18 hours straight (the car ride to Devil’s Tower + more). Thanks! Really cool guys!!! Loving this blog!!! Yip that is where I would like to return to: Yellowstone lake and I want to stay in their lodge there. So beautiful! Have you passed signs for the corn palace yet? When we drove from Boston to CA we saw lots of signs advertising things. They started advertising for Wall Drug, SD when we were still 500 miles away. We were like… this place must be awesome so many signs for it. We were very wrong. We then started seeing signs for the corn palace and we were like okay fool us once… shame on you… fool us twice and well… you know the rest. We made to to CA and looked up the corn palace and 10 years ago it looked like it might have been worth stopping at for a quick break. Shockingly, we too stayed in Rapid City. Mt Rushmore and the Badlands are very cool. We didn’t have time for the other places on your trip. Enjoy! We have not seen the signs to a Corn Palace, but saw plenty for Wall Drug. We will have to keep our eyes open for it.